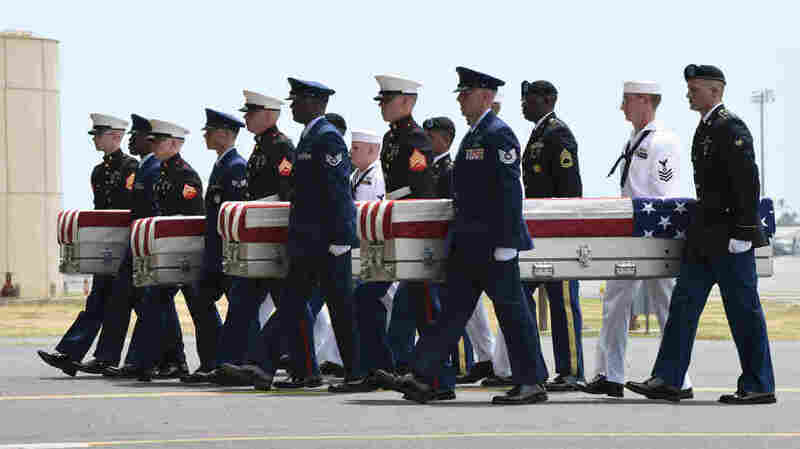 Possible U.S. Remains Turned Over By North Korea Arrive In Hawaii For Analysis Vice President Pence was on hand when 55 boxes thought to contain remains of U.S. troops arrive at Joint Base Pearl Harbor-Hickam in Hawaii. They will be sent to a lab for possible identification. Military members carry transfer cases from a C-17 at a ceremony marking the arrival of the remains believed to be of American service members who fell in the Korean War at Joint Base Pearl Harbor-Hickam in Hawaii, on Wednesday. "Some have called the Korean War the 'forgotten war.' But today, we prove these heroes were never forgotten," Vice President Mike Pence said at the ceremony at Hawaii's Joint-base Pearl Harbor-Hickam. "Today, our boys are coming home." Later, President Trump in a tweet thanked North Korean leader Kim Jong Un for "sending home the remains of our great and beloved missing fallen!" A U.S. military aircraft left North Korea last week carrying 55 boxes handed over by Kim Jong Un's regime that are believed to contain the remains of U.S. service members. While the provenance of the remains has not yet been confirmed, they're being treated with the respect that's traditionally accorded to fallen U.S. troops. Each container of remains was accompanied by one Marine, one sailor, one soldier and one airman as part of an Honorable Carry Ceremony. Adm. Phil Davidson, commander of the U.S. Indo-Pacific Command, saluted. From the base, the remains will be taken to a laboratory in Hawaii for possible identification, with the goal of matching them with any of the 7,697 U.S. personnel who remain unaccounted for after the Korean War. The work will be carried out by the Defense POW/MIA Accounting Agency, which for years has been collecting DNA samples from families whose relatives never returned home from the Korean War. "With these 55 sets of remains that are being repatriated, there was one single soldier's dog tag," NPR's Anthony Kuhn reported from the Osan Air Base. "And the military says that it has already notified the soldier's family that his dog tag has been found." DPAA spokeswoman Kristen Duus told NPR's Ailsa Chang, "We find remains very frequently that don't always have ID tags with them." Once the boxes are in DPAA custody, the first step will be to inventory them to determine whether the remains are those of Americans, Duus said. If other remains are found in the boxes, she added, the agency will contact other countries to inform them about the possible return of a service member who went missing in action. The lab will then set about trying to match any American remains with the identities of MIA personnel. That process, Duus said, can take a very long time depending on how degraded the remains are. Some might have been buried in a casket, for instance, while others may have been exposed to the soil. "Sometimes identifications can be made in a matter of a couple of days, depending on what kind of antemortem records we have for the service members," Duus said. "Some identifications can take up to years to complete." It's taken decades for the possibly American remains to be returned. But in that time, Duus said, the identification process has improved. "Our science has also improved exponentially in recent years, so our DNA analysts can now make a more complete identification with less DNA," she said, "which does help offset the age of some of the remains." In North Korea, officials have previously said they have the remains of as many as 200 U.S. service members. Of the 55 boxes that were turned over, Duus said her agency will work to figure out how many sets of remains that represents. It's possible, she said, for some remains to have become commingled. "This is a continued partnership that President Trump and Chairman Kim have made," she said, referring to the deal the two leaders struck as part of their recent meeting in Singapore. Of the boxes that were recently turned over, Duus said it "is definitely a historical and monumental gesture between the two nations." It's possible that questions about the identities of the remains could persist for years to come. Duus said the DPAA is still working to identify remains it received in the 1990s and early 2000s.